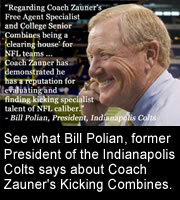 Snapping Camps For "The Vital Man"
Coach Zauner has personally coached 90 plus NFL Kicking Specialists and 22 PRO Bowlers. 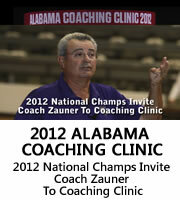 Coach Zauner’s ONE on ONE Students bring home prestigious Ray Guy, Lou Groza and Fred Mitchell Awards. Coach Zauner teaches ‘A Natural Style of Kicking and Punting’ which produced results for these 2012 NFL Draft Class Seniors. ONE on ONE Kicking Lessons produced results for these NFL Kickers: Josh Scobee, Sebastian Janikowski and Shayne Graham. ONE on ONE Punting Lessons have produced results for these NFL Punters: Jon Ryan, Dave Zastudil and Tim Masthay. Emphasizing ‘A Natural Style of Kicking and Punting®’, Coach Zauner’s teaching philosophy facilitates an environment where kicking specialists develop the skills, technique, and confidence to achieve their maximum physical and mental potential. At an amateur and professional level, Coach Zauner, LLC programs and events provide a kicker, punter or snapper ‘A Specialist’s Path to PRO Football®'. Coach Zauner has now coached, consulted and trained over 120+ NFL and CFL professional kicking specialists Including 25 NFL PRO Bowlers during his career. 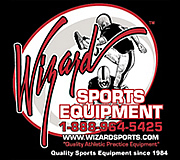 Coach Zauner's Programs include: ONE on ONE Kicking, Punting and Snapping Lessons to improve and refine technique. The PRO Development Camps in January, May and July are not only to improve an individuals technique but to also have competition amongst other top notch specialists. The College Senior and Free Agent Specialist's Combines are my 'Field of Dreams' for kicking specialists to show case their talent to professional teams.